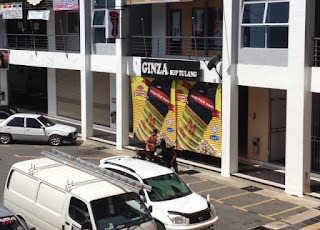 It does occurred to me that even though the name of the place refers to a type of local kuih, the latter does not seem to be present within their current menu. Maybe it has before but has been unavailable since (because I do notice that the place has been around for a number of years now). What got me curious though was the fact that ever since they’d taken over from the previous tenant (that being the Indo Taste 2), customers had been few and far between but they’d somehow managed to hold on until now. There must be something special that made them survive this long right? Oh and by the way, they’re right in front of a more popular hangout eatery called Food Central, within the Fajar Complex area. So one evening my mom decided that it’s time for both of us to check them out (yup, even my mom noticed their somewhat unusual situation). We had zero prior information on their food so when we arrived; we’d managed to go through their menu for 10 seconds flat because of how limited the items were. But I must say that they’d managed to surprise us with their food. Their menu consists of mainly local cuisines so we’d ordered their Blackpepper Chicken, Mushroom Steamed Fish and Mix-Vegetables and all of them had above average tastes. My personal favourite has got to be their Blackpepper Chicken which tasted more like chicken marinated in some thick sweet soy sauce but it suited my taste buds. Mom preferred their Mushroom Steamed Fish, as she liked the fragrant aroma as well as the agreeable way they’d steamed the fish (as it is not overwhelmed by ginger). One thing that they can consider improving on (and might contribute to their lack of patrons) is their service. A waiter was very slow on his feet and was rushing us for an order while another one was just lounging on a lounge area, busy looking through his phone without even bothering to acknowledge us. Such a shame though considering the food was pretty good. 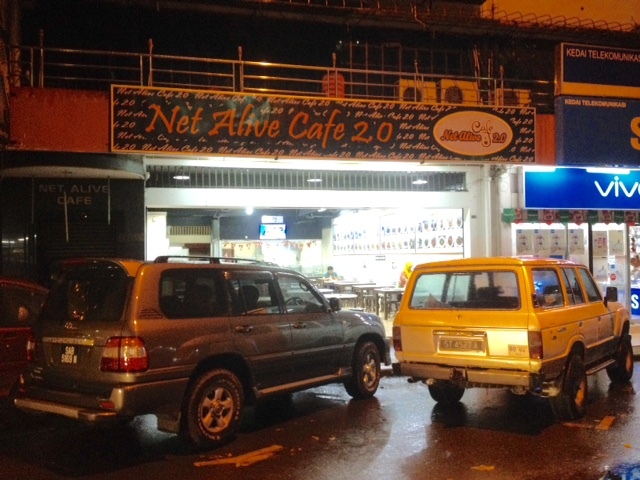 Remember the time when I told you guys about a few locally popular night time spots for food in Tawau? No? Anyway, there seems to be a few new rookies in town vying for the title as well. Well, somewhat new anyway since the places had been previously opened to the public but were forced to seize business due to permit problems (the former) or due to unsuccessful ventures (the latter). But it seems that the management (that obviously being the King Park Hotel right next door) has sorted out the legal stuff and now the place is more alive than it was before its premature closure. Unfortunately this place is tiny compared to the other two more popular food stall areas that I’ve reviewed before (just to recap, that areas being the Takada Food Stalls and also the Empire Food Stalls). There’s limited stalls being opened here (only around 10 stalls) and an even limited spaces for patrons to sit and hangout. But that obviously did not stop people from stopping by the site daily. Among the stalls that are available includes ice coffee stalls (it seems that the trend hasn’t died out yet), yong tau foo, soupy dishes and made-to-order food stalls. We’d decided to order some Nasi Goreng Lalap, Nasi Goreng Daging and a Sizzling Chicken dish from this particular stall and I must say that I’m not disappointed at all. Their Sizzling Chicken was particularly memorable since it’s quite tender and juicy. Meanwhile, a few vendors came and went from the area in front of Emadira textile shop throughout the years, probably due to the lack of customers. Place wise I would say that it is very strategic (it’s smack in the middle of the Fajar Complex area) but the lack of interest by patrons might be due to an even smaller choices of food than the previous makan place. We’d dropped by recently to sample some so-called grilled burgers from a new stall hailing from Pulau Sebatik no less (obviously at my partner’s insistence). The Burger Bakar Kukus disappointedly turned out to be very ordinary looking and tasting (and I mean really, really ordinary – like any non grilled burgers out there). We were a bit unsatisfied after that so we’d decided to order some satays from another stall right next to them and that turned out to be quite nice. Also, the place only has a banana fritters stall apart from the other two that I’ve mentioned; as the area was mainly ‘anchored’ by a bigger food & drinks stall right in the middle of the square. I was driving alone for lunch one day and was in the mood for something sweet when I decided to pay them a visit. The contemporary family run café feels both cosy and easeful, a perfect place to unwind. Well, it would be even more perfect if they provide free wifi (which they do not), something that is essential in any successful café. They’d also applied the self-service order system here, so after browsing through their menu board for a couple of seconds (and that yummy display of cakes), I’d decided to let my stomach guide me and ordered their Chocolate Indulgence Cake, Chocolate Banana Waffle and a hot cup of mocha. Yes, I know… I OD on the sweetness department at that time but I wasn’t thinking straight (again, I blamed everything on my empty stomach). Let’s start off with the best among the three. I absolutely loved their hot mocha. I admit that I do not know much about the greatness that is coffee but this mocha suits my taste with its well balanced of caffeine and chocolate. Their cake was also delectable, what with its smooth texture and toothsome taste. But as an avid waffle fan, I was let down by the latter. The waffle itself came out very hard and overly burned. A tad too long in the waffle maker perhaps? Since this is not a Japanese joint (like duh) it was no surprise that their menu consist of mainly locally popular cuisines. My dad opted for Nasi Goreng Kampung (I did have a bite and I must say that it’s yummy, with the right amount of spices) while I ate their Nasi Lalap (the sambal was notable but everything else was just ‘meh’). Although mom was present during that time, she decided to tapau a Mee Hoon Sup Ayam instead, since she just got one of her tooth pulled out at a nearby dental clinic. Mom did mentioned later on that the dish was good with a lot of shredded chickens being added into it. And it does not escape my attention that none of us actually tried out their namesake dish during said visit. Oh well, maybe next time huh? 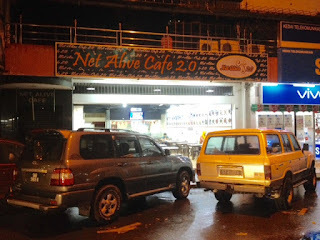 During another rainy evening recently (by the way, Happy Lunar New Year everyone… it’s finally ‘my year’ this time around), me and my partner was roaming around the Fajar Complex area (as per usual) when we spotted this particular eatery. The place was once a restaurant which caters to mainly fish dishes but it seems that after a few months (or is it a year?) their business doesn’t seem to be taking off so now it’s a regular café which features regular local cuisines. If you’re a Tawaurian, you might think that the name of the place sounds somewhat familiar. It is currently (I assumed) owned by the same people that had opened the Net Alive (a pub just above the premise) hence the 2.0 thingy. It’s very near to the Fajar branch of Milimewa Superstore and on the same row as a shop that sells cooking gas called Man Tong Shing. In terms of food, I honestly think that they have a long way to go since the dishes that we had were just so-so. My order (a Nasi Goreng Special of sorts but with a fancier name that I can’t seem to remember) was disappointingly tasteless and dry while my partner’s Kung Pao Chicken Rice fare slightly better than mine but still nothing extraordinary about it. But I did peek into their fridge and got myself a homemade butter cake. Even though it might look very plain but it was surprisingly very moist, with just the right amount of sweetness to suit my liking.